In the last months of my internship at FSFE, I started following debates around TTIP (the Transatlantic Trade and Investment Partnership). TTIP is a huge “deep and comprehensive” free trade agreement between the US and the European Union, which started to be negotiated in July 2013. Well prepared by the great ACTA scandal of 2012 and by the November 2013 leak of the Trans Pacific Partnership (TPP)’s Intellectual Property chapter (thanks Wikileaks), we immediately looked for the impact of TTIP on software patents, copyright enforcement and DRM (digital rights management) circumvention. After a few months working full time on the topic, I now believe that the problem is much deeper that any of these specific issues. A growing pernicious trend that is greatly affecting digital policy around the world is called “policy laundering” – the use of secretive international trade agreements to pressure countries to commit to restrictive or overly broad laws that would not ordinarily pass a transparent, democratic process. Not only is the behind-closed-doors procedure questionable, many of the representatives negotiating such agreements are not elected representatives but rather trade appointees and powerful multinational corporate lobbyists. Policy laundering deprives each jurisdiction, and most important their citizens, the chance to engage in a legitimate legislative debate. The agreements are negotiated for years, in secret. 1) Access to a limited number of negotiating documents is only granted to the few MPs member of trade committees (INTA in the case of the European Parliament). This access is made via “secure reading rooms”. They can take no notes, bring no devices. They cannot come with staff members specialized in Trade Policy. Seeing the complexity of trade deals’ texts (often over 1000 pages of legalese) and the fact that the devil is always in the details, they are highlight unlikely to manage anything useful with this kind of “access”. 2) Even if they do spot something harmful in the negotiating text, no elected representative sits at the negotiating table. They have very little leverage to influence the negotiating process whatsoever. 3) Secrecy around the negotiations make campaigns very difficult. Activists are often forced to fight without knowing what they fight, until it is too late (building a campaign takes time). They are either restraining themselves in order to not say anything untrue, or basing their work on guesses. It is then easy for the deal’s promoters to dismiss the critics as “lies” or “misleading“. Reversing the burden of the proof this way is highly undemocratic in itself. Fortunately, there are still great people working in the institutions. Documents are leaked surprisingly often, enabling us to criticize secrecy AND to know what we are talking about when discussing the content. Thank you sources. After years of negotiation, the deals finally arrive in front of parliaments for ratification. MPs are then supposed to say a simple “yes” or “no” to a thousand pages of text, likely to include good and terrible things. In case of bad wording, loopholes, blurry definitions, harmful provisions, MPs cannot amend but have to reject the whole agreement. The pressure to ratify, after “so much effort put into the negotiating process”, is enormous and trade deals are therefore usually overwhelmingly ratified. Fortunately, sometimes things do not go as planned, like in the ACTA case. In Europe, trade and investment are EU competences. However, “deep and comprehensive agreements” deal with more, including sectors that are still competences of the Member States. After ratification by the European Parliament, such deals must therefore also be ratified by national parliaments. Because democratic processes take too long, they can enter into force provisionally, which means before ratification – the vote of elected representatives. The provisional entry into force exerts pressure on national parliaments to vote in favor of the agreement. When ratification might be difficult, or event rejected in a country or region (for federal states), the ratification is not put on the Parliaments agenda and the provisional implementation stays in force. Worst, states who did not ratified a trade or investment agreement, but have it in force because of the provisional application can be attacked via dispute settlement mechanisms included in the deals. [it] needs to be emphasized here that Russia only accepted the provisional application of the Energy Charter Treaty (pending ratification) in 1994 meaning that the country will only apply the Treaty “to the extent that such provisional application is not inconsistent with its constitution, law or regulations.” Same was the approach adopted by Belarus, Iceland, Norway and Australia. I strongly encourage you to read the whole analysis. What it means is that a government can sign any treaty, with far reaching consequences for its population, economy, environment and ability to legislate, and the state can face the all the consequences of the agreement without ever having asked the parliaments’ approval. Free software is important, but it is only one of many crucial policy issues. Trade deals like TTIP or CETA can have an impact on free software – and I will describe concretely how in a next post -, like on everything else you care about, be it pesticides control, financial regulation or animal welfare. More importantly, they modify policy making as a whole, making it less transparent, less democratic and harder to reform for the best. However, ff enough pressure is put on members of the European Parliament, 2014 might see the second strong rejection of a dangerous secret deal, after ACTA. CETA ( Comprehensive Economic and Trade Agreement), the EU-Canada deep and comprehensive free trade agreement, was concluded last week. It will be initiated in September and its ratification process in the European Parliament will start this Autumn. A good moment to send a strong message to the European Commission and to our governments: policy laundering is not a legitimate way to legislate, and should never be. Yesterday Erik and I went to the first Open Knowledge Festival Meetup in Berlin. The event aimed at presenting the festival and build links between the various Open communities. The format was interesting, it was a “speed geeking”. Seven tables, groups of 10 to 15 people and one speaker per table, presenting his/her project. We were supposed to “give the audience a broader idea of what open is”. I did seven times the same five minutes talk, presenting FSFE, Open Standards and Document Freedom Day. My talk insisted on the aim (freedom), and not on the means (opening stuffs). 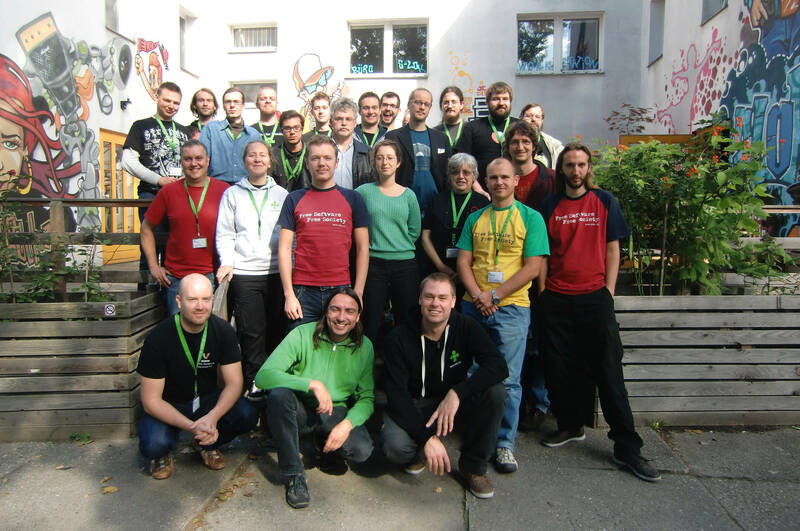 After a short presentation of Free Software and FSFE, I switched to Open Standards and tried to explain why something even more technical and remote than software (standards) was also political. Like with Free Software, questions around standardisation (or the lack of standardisation) often boil down to “who controls the technology we rely on?”. Since people in the audience where mostly open knowledge, open culture and open data advocates, I stressed and explained why to be archived in the long run and spread as widely as possible, data has to be in Open Standard. The train tracks metaphor worked well to explain standards. If all train tracks have the same width, trains can run everywhere. If each 15km the width changes because a different company built it, long distance train lines can’t exist. From there it is possible to go back to IT, digital collaboration and freedom of choice. With a few more minutes, it would have been nice to extend the topic to DRM and other creative ways invented to lock users in (and why we shouldn’t accept them). All the topics we work on are linked, we can’t stress that enough. The other talks sounded very interesting too, but I could unfortunately not listen to them. See Hacks Hackers Berlin, Africa Hack Trip, Open Bank project and Code for All from (de) Open Knowledge Foundation Germany. Looking forward to doing more with these communities! Yesterday night a dozen international journalists (Spain, Finland, Japan, Germany, Poland) gathered at IN-Berlin, thanks to Hauke and Malte. After almost two hours of interview, we introduced them to email encryption with Free Software. The interview part was extremely enjoyable. Unlike during our usual cryptoparties, we didn’t give any formal talk at the beginning but answered all their questions. The discussion went from Snowden leaks to computer security, Free Software, global surveillance, social media to basic ITC technical and political concepts (software, service, open standard, vendor lock-in, network effect..). There was as many woman than men in the journalist group as well as in the “teachers” group: impressive ratio in the Free Software world. In general, the Berlin cryptoparty team is getting better, more united and grows each time we work together; and that is inspiring.